Zamo’s back after a month-long hiatus due to Technical Support Monkey’s flu, which Ig thinks was probably AIDS, based on what Cousin Sticky’s gossip blog says about Technical Support Monkey’s library activities. Aside from fighting with and then shunning Technical Support Monkey, Zamo’s also been fighting with Georgie over control of the TV remote, and Ig goes so far as to try to get Georgie’s dead friend from art school to take Iggy’s side with a beyond-the-grave message from the other side of the woo woo barrier. On the upside, Mr. Hydell comes by to gross Georgie out with hunting tales and a wolfskin blanket to keep Zamo warm. Zamo spent the last week shunning Technical Support Monkey for getting all uppity and turning her phone off when Iggy was trying to use Skype to tune into ‘The Technical Support Monkey Show’ when there was nothing good on TV. Zamo would still be shunning the damn chimp were it not for a direct order from Iggy’s dad, who’s had enough of Zamo’s mom spazzing about the lack of podcast updates. 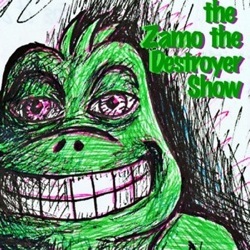 In other news, Zamo is working on getting ‘the retard in the Canadian white house’ to throw Technical Support Monkey in jail for iguanaphobia.